(without stand or speakers) 37.4" x 24.0" x 3.9"
With our 37" LCD Display, Panasonic now has a complete line of hospitality displays to fit your hotel needs. 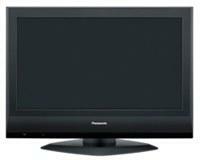 The TH-37LRT12U 37" LCD combines impressive image quality with a sleek, sophisticated black cabinet design. Its ultra-thin, space-saving design also offers the flexibility of three terminal board slots concealed in the back of the display panel.